John Archibald WHEELER (naskiĝis la 9-an de julio 1911 en Jacksonville, Florido; mortis la 13-an de aprilo 2008 en Hightstown, Nov-Ĵerzejo) estis usona teoria fizikisto. Laste li estis emerita profesoro ĉe la Universitato Princeton. 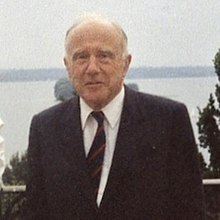 John Archibald Wheeler donis nomon al la nigra truo. En 1996/1997 li estis premiita la Wolf-Premio pri Fiziko. Li mortis 96-jara en sia domo en la usona ŝtato Nov-Ĵerzejo pro sekvoj de pneŭmonio. kun Charles W. Misner, Kip S. Thorne: Gravitation, W. H. Freeman and Company, San Francisco 1973, ISBN 0-7167-0334-3(0). kun Edwin F. Taylor: Spacetime Physics, W. H. Freeman and Company, San Francisco 1963/1966, ISBN 0-7167-0336-X. Einsteins Vision – wie steht es heute mit Einsteins Vision, alles als Geometrie aufzufassen? Springer, Berlin-Heidelberg 1968. Superspace and the nature of geometrodynamics, in Cecile M. De Witt, John A. Wheeler (Hrsg. ): Relativity, groups and topology – Battelle rencontres 1967 Seattle Center, 16 July to 31 August 1967. W. A. Benjamin, New York-Amsterdam 1968. John R. Klauder: Magic without magic. John Archibald Wheeler, a collection of essays in honor of his sixtieth birthday. Ed. by John Rider Klauder. Freeman, San Francisco 1972. Ĉi tiu paĝo estis lastafoje redaktita je 14:08, 3 mar. 2019.